As resident Marvel stan around these parts, I won&apos;t front like the idea of a new TV series set in the DC Comics universe had me excited from the jump, even if it was initially described as The Office with DC superheroes. [Ed. Note: The Office mention excited him more.] The idea felt similar to Marvel&apos;s Damage Control comic book series, which is also set in a superpowered world but deals with the regular citizens coping with the clean up (and also rumored to be getting its own television series). And when Vanessa Hudgens signed on as star of the series, my interest was piqued...even if I&apos;m not sold on anything coming out of the DC Cinematic Universe right now. This is an interesting time in Hudgens&apos; career. The now 28-year-old actress has been in the limelight for the last 15 years, but this series is her first ongoing work on television. She&apos;s more known for playing Gabriella Montez in Disney&apos;s High School Musical movie series, and has spent the last decade in a number of Hollywood films, including Zack Snyder&apos;s Sucker Punch, co-starring with Dwayne "The Rock" Johnson in Journey 2: The Mysterious Island, Spring Breakers, and Robert Rodriguez&apos;s Machete Kills. She&apos;s done her own thing but the network sitcom set in a comic book universe? It&apos;s an intriguing move. Her inclusion in the program is what took it from being a "I might DVR" to a bonafide anticipated show for 2017, which, sure, is by design (because star power), but there&apos;s something about Hudgens, especially coming off her performance in Grease Live, that had me open. 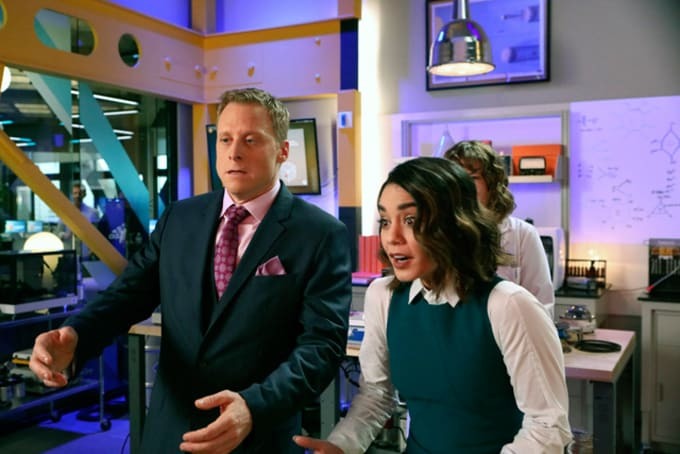 In Powerless, which premieres tonight at 8:30 PM on NBC, Hudgens plays Emily Locke, a young woman who moves to Charm City to work as Director of the Research and Development wing of Wayne Enterprises. Yes, that Wayne, but she&apos;s working for Van Wayne, Bruce&apos;s cousin. As Complex&apos;s Frazier Tharpe put in his look at the Powerless pilot, "Vanessa Hudgens somehow out-peps herself," and during a recent chat with Hudgens during a quick break from filming, she agreed. "My character is a lot like myself," she said. "I knew that I would have a lot of fun playing her because Emily is Vanessa at her happiest." That isn&apos;t the only reason she took the role of Emily, though. While admittedly unfamiliar with the world of comic books—she does cite Tim Burton&apos;s Batman as a childhood favorite and calls Michelle Pfieffer&apos;s Catwoman "my everything"—she was immediately drawn to the style of the show. "My favorite TV shows are The Office, Parks and Rec, [and] 30 Rock. Those workspace comedies that NBC is so good at doing. When I found out they were doing another one, and I had an opportunity to be a part of it, I was like, &apos;Of course.&apos; And the fact that it was DC Comics&apos; first comedy means it was going to be something that was really original. I thought it would be a cool, new, fun take on things." Similar to FX&apos;s Legion, Powerless will be set in a comic book universe but will stand apart from a more interconnected cinematic universe, in contrast to what Marvel is doing with shows like Agents of S.H.I.E.L.D. That doesn&apos;t mean we don&apos;t get comic book characters hitting the show, though; the pilot features an appearance from the Crimson Fox, and there&apos;s even a romance between Hudgens and one of the nefarious individuals roaming the town sometime down the line. "The last episode that we filmed, Emily dates a henchman," Hudgens told us. "Which is just a casualty that happens in Charm City." Hudgens is crystal clear that the show isn&apos;t just about what superheroes or villains they can cram into the series. "It&apos;s about normal people living their lives, and my character trying to inspire others and to try to make a change with a really positive &apos;go-get-&apos;em attitude.&apos; It&apos;s just Emily really trying to inspire [her team], and then being extremely over it." As we learn pretty early in the pilot, one person who&apos;s extremely over it is Van Wayne, who&apos;s played by Alan Tudyk (who recently played K-2SO in Rogue One: A Star Wars Story). "He&apos;s always ad-libbing," Hudgens says of working with Tudyk. "He&apos;s such a smart guy and he&apos;s been doing comedy for so long. The way his brain works is wired for comedy. He comes up with stuff, and then at the end of the take he&apos;s shaking his head thinking &apos;why did I just do that?&apos; He just cracks me up. 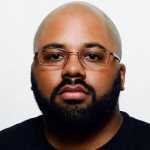 It&apos;s just a really awesome environment to work at." Although Hollywood is seemingly all-comic book everything right now, not even Hudgens knows the future of Powerless is past its initial 12-episode run. She can&apos;t wait for you to see it, though. "I have a really good feeling about it. The writing is so funny. The cast is so funny. I personally cannot wait to watch the show. I think that in this day and age, we all need a laugh a bit more. I think it will be a good, fun escape for audiences all over." Truth be told, that&apos;s the whole reason many of us escaped to the realm of comic books in the first place: escapism from whatever was bothering us in life. The ability to, like Hudgens, drift into a far-away land and dream about being the fully-realized versions of ourselves. Only she gets to act it out for the world to see, and while all good things must come to an end (at least until a second season is ordered), Hudgens isn&apos;t ready to let the experience of working on Powerless go. "I don&apos;t want it to end. I&apos;m going to be so sad when we finish filming because it&apos;s really a unique experience. This is definitely the hardest I&apos;ve ever worked in front of the camera," she says. "It&apos;s a really special thing being able to do a TV show that you love with people who you adore. I look forward to going to work everyday. And I know that I&apos;m working hard so it feels good. But also, I&apos;m having so much fun. And I think that the audiences are really going to enjoy this show."